It could be said that the platforming genre has lost its way recently, from seemingly endless rehashes of Mario to the punishing difficulty of Super Meat Boy. The fun of the genre has been condensed and divided into niches, be that nostalgia or desire for higher difficulty. With Rayman, a series that has also gone through an identity crisis over the years, it seems that there is still hope. Hope for a platformer that is purely based on fun, timing, and amazing presentation to boot. Rayman Origins is such a game. Like a classic and pure platforming title, Origins doesn’t have much a story, nor does it need one. There is something about an old lady who got annoyed at Rayman and his friends and unleashed evil creatures on the world. Your goal is to traverse the game’s various environments and rescue the Nympths and Electoons along the way. It’s a very lighthearted and basic plot, and it works perfectly well with this title. 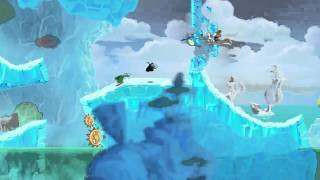 Rayman Origins is a side scrolling platformer which borrows a lot of elements from the first game in the franchise. Jumping and running around the levels is effortless and fun, requiring some precision and timing but not overly so. It’s classic platforming action at its best, and though Rayman could control a little tighter, most often a blast to play. The game’s level progression is based on making it to the end, and also collecting the various Lums hovering around the level. Collecting enough earns you more Electoons, which are in turn required to progress through the game.The progression curve is very fair and you likely won’t need to replay any levels, even if you missed a few collectibles, in order to go on. As you progress through the game’s numerous levels, which overall last a decently long 8 to 9 hours depending on skill, Rayman earns new abilities. Starting off with just basic jumping, you’ll soon earn the ability to glide in the air, run up walls, and dive underwater. All these elements are immediately used in the levels that follow, letting you fully explore the environment. It’s perhaps a missed opportunity that there are no secret locations in early levels that can only be reached later, upon replaying the level with new skills. Each level features a number of enemies, which range in their basic abilities. All can be defeated with good timing and Rayman’s basic attack, resulting in a satisfyingly simple combat system. Most of the game can be completed with little trouble, though some difficulty spikes do exist and can be frustrating, trial-and-error experiences. Thankfully the levels are broken up into sections, so if you die and have to start the whole section over, there isn’t a ton of progress that is lost. Rayman Origins is ranked #88 out of 1434 total reviewed games. It is ranked #18 out of 112 games reviewed in 2011.